The silver-spotted skipper, Epargyreus clarus, frequents roadsides, fields, and backyard gardens throughout North America. Skippers dash quickly from flower to flower, as if they are skipping around the meadow. What Do Silver-Spotted Skippers Look Like? Chances are you've seen a silver-spotted skipper. With their brown wings and quick movement, they might not be the first butterflies you'd stop to observe. Take a closer look, and you'll notice bands of orange on the forewings, and a silvery patch in the center of the hindwings. The silver-spotted skipper is the largest skipper in North America, with a wingspan of 1 3/4 - 2 5/8 inches. Silver-spotted skippers have enormous eyes that appear to bulge out from the head. Epargyreus clarus also has short antennae with clubbed ends. The odd-looking caterpillar has an enlarged head capsule and a pronounced neck collar. With a deep rust or black head and two bright red eyespots in the front, the caterpillar appears quite like a cartoon alien from outer space. The larva's body is yellow-green, with thin dark lines running across its width. 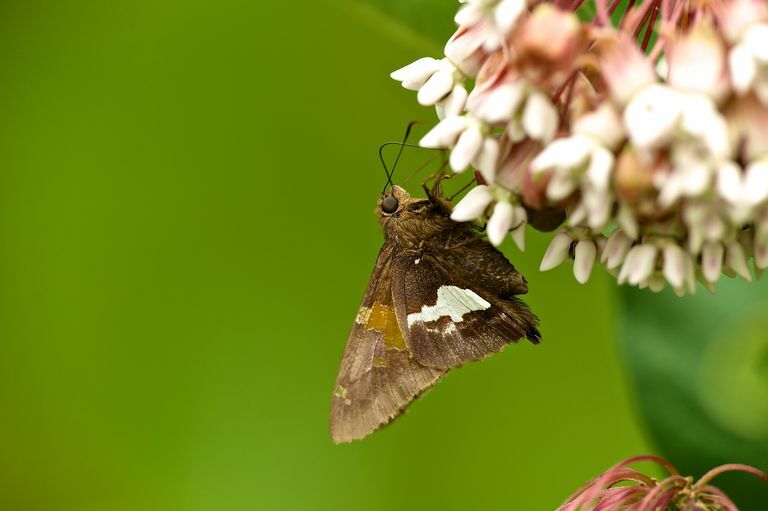 By some accounts, the silver-spotted skipper lays her eggs on plants near the host plant, but not on the actual host. This requires the newly hatched larva to crawl and locate its food source. Most experts seem to dispute this theory, and argue the butterfly lays directly on the host plant. How Are Silver-Spotted Skippers Classified? What Do Silver-Spotted Skippers Eat? Larvae feed on legumes, especially woody legumes. Black locust is the favorite host plant. Other host plants include honey locust, false indigo, bush clover, and tick-trefoils. Adult silver-spotted skippers nectar on many flowers, but show a clear preference for blue, red, pink, or purple varieties. They rarely visit yellow flowers. Like all butterflies, the silver-spotted skipper undergoes four stages during its life cycle, a complete metamorphosis. The generations per year vary by region, with southern populations having the most broods. Egg - Green, dome-shaped eggs are laid singly on upper side of leaves. Larva - The caterpillar has a large brown head, with red eyespots at the front. The body is a yellow-green color. Pupa - These skippers overwinter in the chrysalis, hidden in rolled leaf litter. Adult - Adults emerge in spring. Males perch on tall weeds or branches, watching for females. They also patrol for potential mates. At night, or when the daytime weather prohibits flight, silver-spotted skippers hang upside down under leaves. Caterpillars build themselves tiny shelters using carefully cut pieces of leaves. As they grow, they abandon their old homes and build larger ones by joining leaves with silk. Where Do Silver-Spotted Skippers Live? 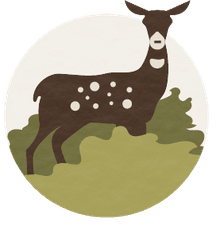 Open parks, fields, gardens, and meadows, and where larval food plants are available. In North America, the silver-spotted skipper is common from Mexico to southern Canada, with the exception of the Great Basin region and western Texas. Worldwide reports include sightings in parts of Europe, Asia, and Australia.